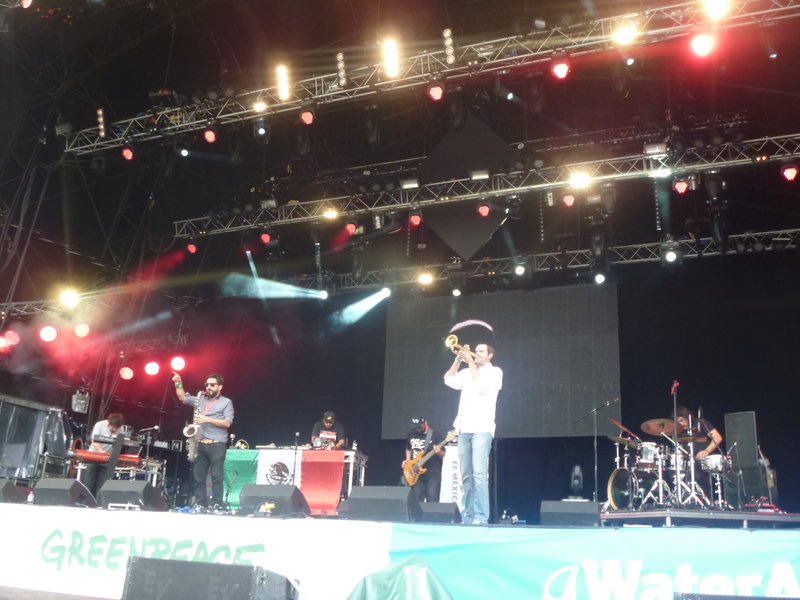 Mexican jazz fusion band Troker performing at Glastonbury Festival for the second consecutive year. Apologies for the recent radio silence. I spent the last two weeks in England, hence the lack of updates. I’m now back in Guadalajara so normal service will be resumed shortly once the World Cup is over. While I was at home I attended Glastonbury Festival, the world’s greatest live music event. Among my personal highlights were Friday-night headliners The Arcade Fire, Led Zeppelin frontman Robert Plant, Bristol-based trip-hop pioneers Massive Attack and reggae legends The Wailers. I also watched Mexican jazz fusion band Troker perform at the festival for the second consecutive year. The band from Guadalajara drew a larger crowd than last year as they showcased tunes from their brand new album Crimen Sonoro. After their gig on the West Holts Stage, trumpet player Gil Cervantes and saxophonist Arturo “Tiburon” Santillanes also joined London’s sample-proficient duo Public Service Broadcasting for their live set. Once Glastonbury was over I happened to stumble across a Zapatista mural on the streets of Brighton. The mural was of iconic pipe-smoker Subcomandante Marcos, who appeared to step down as spokesperson for the Zapatista movement earlier this summer. Mural of Zapatista spokesman Subcomandante Marcos in Brighton, England. While street art dedicated to indigenous Mexican rebels may seem incongruous in a southern English seaside town, it is not entirely surprising given that Brighton is arguably the most liberal city in the country. The UK’s gay capital, it is also the only constituency represented in Parliament by the Green Party. 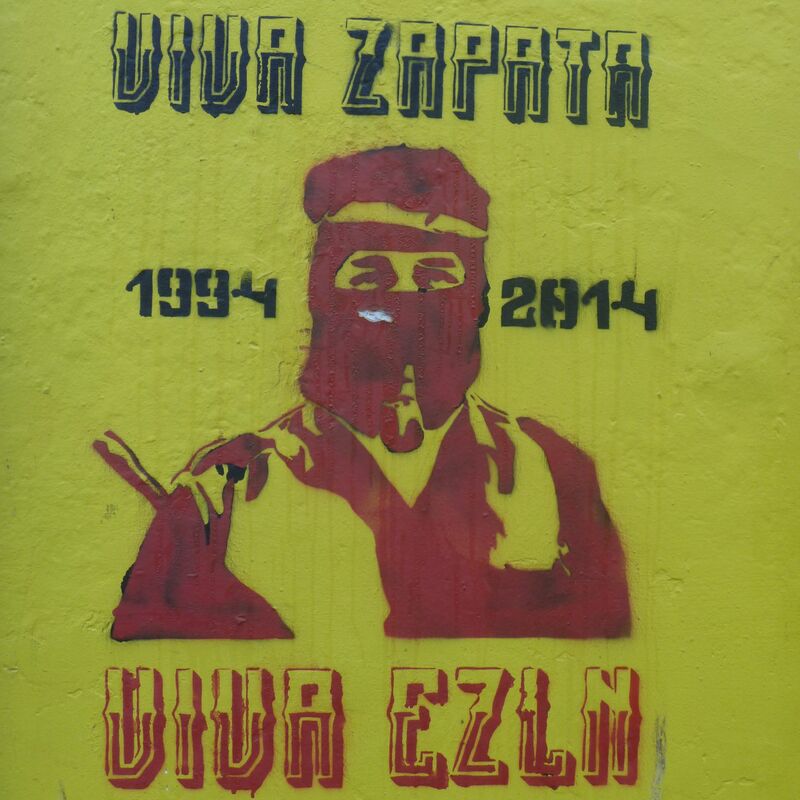 The Zapatistas have long enjoyed support from certain pockets of Europe and Brighton is probably foremost of all the places in England where people might sympathize with their movement.